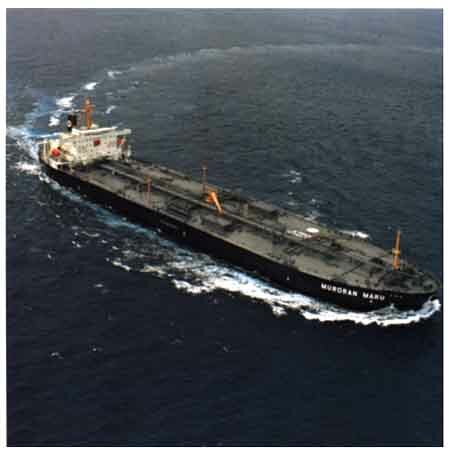 MURORAN MARU, a double-hull aframax tanker ordered by Tokyo Tanker Kinkai Co., Ltd. of Japan, was completed at the Kure Shipyard of Ishikawajima-Harima Heavy Industries Co., Ltd. (IHI) in November 1996. Cargo tank part is divided into five pairs of cargo oil tanks, one pair of slop tanks and five pairs of double hull water ballast tanks. For excellent speed- power performance, LV (Low Viscous) Fin developed by IHI is equipped. 1. The cargo handling system is designed for two grades cargo oil. Cargo oil is handled by two steam turbine-driven cargo oil pumps (5,000 m3/hx 130mTH) with self stripping systems. In addition, a steam turbine-driven pump and a tank cleaning educator are provided for tank cleaning operation. 2. Heating coils are installed in all cargo tanks. 3. Class approved type emergency towing equipment, which is designed in accordance with 1994 Amendments to the International Convention for the Safey of Life at Sea (SOLAS) 1974, is provided. -Access hatch and inclined ladders are provided on fore and aft part of the tanks. -Double side space is pretty wide for this size aframax tanker. -Four levels of walk ways formed by horizontal stringers are provided. -The tanks are coated with light color modified epoxy paint.